If you require any further information or would like to arrange an appointment to speak to our team please do not hesitate to contact us! 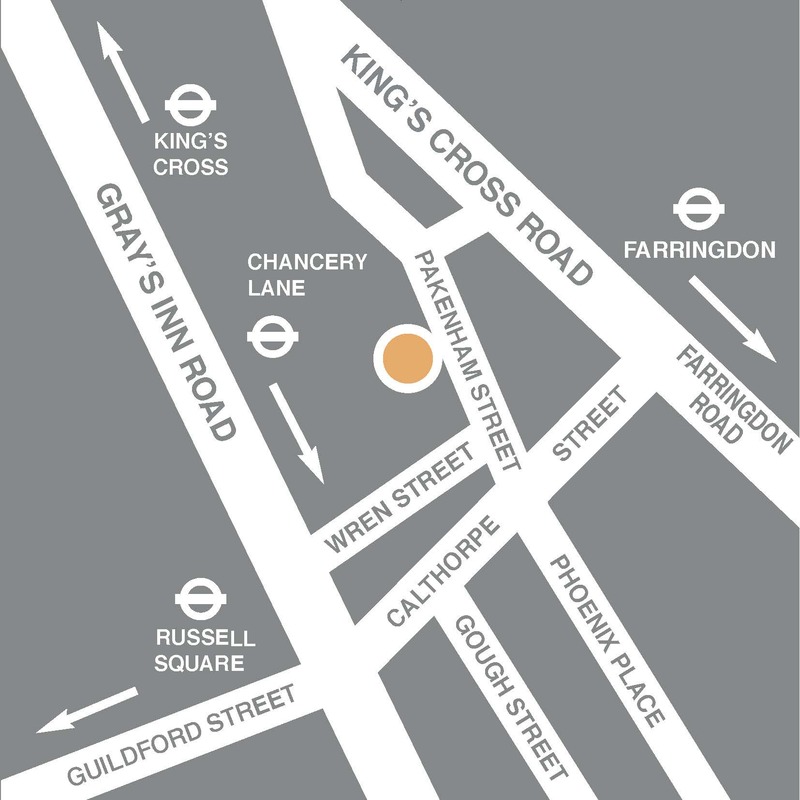 We are located just down from King’s Cross Station in Central London, off Gray’s Inn Road. The workshop is situation on Pakenham Street and there is limited parking space available. If you intend to drive in please call us in advance so we can ensure there is parking available. The nearest overground train station to us is King’s Cross St. Pancras. From the station, head South down Gray’s Inn Road. After 500 meters turn left onto Ampton Street. After a further 150 meters turn right onto Cubitt Street. After 100 meters Cubitt Street turns right slightly and becomes Pakenham Street. Our workshop is located about 50 meters up Pakenham Street on the right-hand side in a small courtyard. Upon exiting the station, turn right and head along Bernard Street. Continue straight onto Brunswick Square and follow the road round to the right onto Lansdowne Terrace. At the end of this road, turn left onto Guilford Street. Continue along Guilford Street for 300 meters, at which point you will meet Gray’s Inn Road. Cross straight over onto Calthorpe Street and continue for 200 meters before turning left onto Pakenham Street. Our workshop is located about 50 meters down Pakenham Street on the left-hand side in a small courtyard. From the station, head South down Gray’s Inn Road. After 500 meters turn left onto Ampton Street. After a further 150 meters turn right onto Cubitt Street. After 100 meters Cubitt Street turns right slightly and becomes Pakenham Street. Our workshop is located about 50 meters up Pakenham Street on the right-hand side in a small courtyard. Upon exiting the station, head north up Gray’s Inn Road. Continue along this road for 500 meters until you reach a 2nd set of traffic lights. At the lights turn right onto Calthorpe Street. Walk for 200 meters before turning left onto Pakenham Street. Our workshop is located about 50 meters down Pakenham Street on the left-hand side in a small courtyard. There are several buses that operate within walking distance of our workshop.